and of course the most famous Reindeer ... Rudolph! Let the 9 Reindeer that pull Santa's sleigh become your birthday party theme. 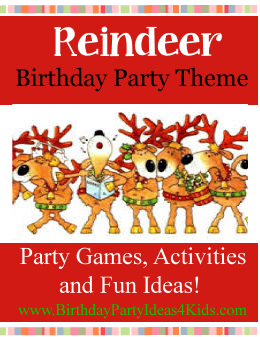 Fun Reindeer themed games, activities and more to help you plan the perfect party! Teams must move across an area using only pieces of poster board. Cut large iceberg shapes from paper about 10 x 12 inches each. Teams are given one more iceberg them the total number in their team. Tell the teams they can only use the icebergs given to them to get from one end of the room to the other. Teams use the iceberg pieces to move by having players stand on the ice burgs all together. Then they take the back ice burg and move it to the front of the line and so on. If a player steps off the ice burg into the water they all go back and begin again. Tie balloons that have been half way blown up (white to look like snowballs) to a string and then to the guests ankles. Then all the kids try to stomp and break each others "snowball". Fun relay style game using ping pong balls and a broom. Color ping pong balls different colors for each team with a permanent marker. Each team should have 3 balls. Divide guests into teams. Give each team their ping pong balls and a small broom. One at a time the players from each team must sweep all 3 ping pong balls to the other side of the play area and back. Then they hand off the broom and balls to the next person on their team. This game is more challenging and fun when played on a smooth floor. Reindeer love to make Snowmen! To play each team needs several rolls of toilet paper, scarves and hats. Divide into teams of 2 or 3. Each team gets two rolls of toilet paper. Decide who in the team will be the snowman and who will do the rolling. On “go” teams wrap their snowman in the toilet paper. When the rolls are all used they must put the hat and scarf on their snowman and yell “finished!”. The first team to finish wins. Have enough paper so each guest gets a chance to be the snowman. Each player needs a small plastic container and spoon and cotton balls. Players put the plastic container on top of their head and balance it there through the game. The players must use the plastic spoon to get a cotton ball and then place it in their container on top of their head. The player with the most cotton balls in their container after 5 minutes wins! If they spill their cotton balls they must start over. Hint: Play a quick practice round of about 1 minute so the kids can get the hang of the game. The object of the game is for the players to try and unwrap the snowball enough to uncover a small prize or candy while it is their turn. Before the party start to make a large round ball (snowball!) by wrapping the packing tape around and around itself. When you have a round base, about 2” diameter, start to add candy and prizes one at a time as you wrap the tape around the ball. When you are done the ball should be large and have candy and prizes inside in layers. During the game have kids sit in a circle. Give the ball to one player and the dice to the player next to them. On “go” the player with the ball will try to unwrap the tape and get to a prize. While the 1st player is trying to unwrap the ball the player with the dice is rolling over and over trying to get doubles. When the dice land on doubles the ball goes to the player that was rolling the dice and they begin to try and unwrap a prize. The dice are passed to the next person. This is a fun and fast paced game! Make small bags of Reindeer food that the party guests can take home and leave out on Christmas Eve to feed Santa's Reindeer. Let guests help mix all the ingredients in a big bowl. The ingredients can vary, but some good choices are uncooked oats, apple jacks cereal (the green ones look like little Christmas wreaths), green and red sugar crystals (the type you use to decorate cakes). We don't suggest using glitter because it might hurt the wildlife after you sprinkle it outside. Take a big spoon and let everyone spoon some Reindeer food into a small ziploc bag. Let them take home their Reindeer food as a Party Favor. Before the party hide white pompom balls around the party area. Along with the white pompom balls hide 1 red pompom ball (Rudolph's nose!). Ask the players to try and find all the pompom balls. The guests who finds the red pompom gets a special small prize. Have the guests go into another room and hide the balls again - play several times. Kids love this game! Have the guests go on a Christmas scavenger hunt. Our Christmas scavenger hunt list has lots of fun items to find and is free to print out. This is a fun and easy party craft - and the kids can take home their reindeer as a party favor after the party! You will need large wrapped candy canes, pipe cleaners in brown, red or green, googley eyes and small red pom poms. Cut the pipe cleaners in half. Wrap a pipe cleaner around the candy cane for the reindeers horns. Glue on the googley eyes and the red pom pom nose. Set up a fun Candy or Food buffet and call it Reindeer food. Set food up in wooden bins and bowls along with glass containers to make it a little more rustic. In a ziploc bag add 8 chocolate covered candies such as malted milk balls and then add one red candy such as a red M & M, foil wrapped chocolate or a red gumdrop for Rudolph's nose. A small book of the "Night Before Christmas"